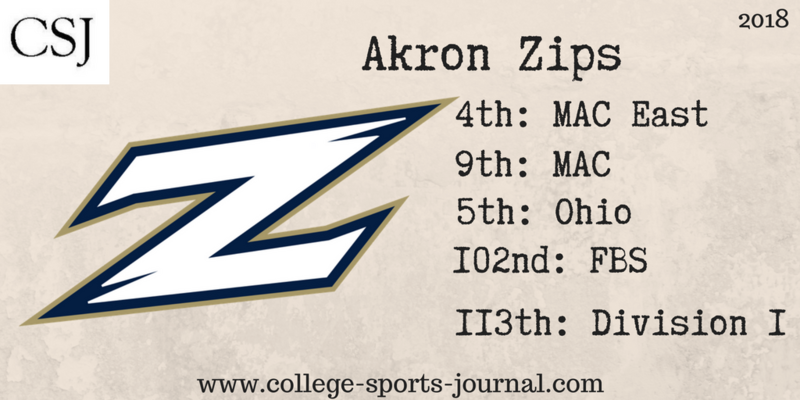 2017 In A Sentence: Akron finished 6-2 within the MAC to win the East Division of the conference but lost in blowout fashion both in the MAC title game to Toledo and the Boca Raton Bowl to Florida Atlantic to finish 7-7 overall. Biggest Shoes to Fill: WR Tra’Von Chapman is the only All-MAC performer gone from this year’s team. The former quarterback moved to the wide receiver position and was a leading receiver for the Zips last year. He led the team in receptions with 53 for 475 yards and two touchdowns. Key Player: QB Kato Nelson emerged in the last five games to help the Zips to the MAC East Division crown in his freshman campaign. He is a two-way threat and last season likely showed just a bit of his potential. Losing the two postseason contests last year showed he has room to improve especially against increased competition levels. For Akron to again be Division champions, Nelson will need to improve more. Fearless Prediction: The Akron defense (led by All-MAC senior LB Ulysees Gilbert III) should be just fine. The offense, however, returns just three starters so how Nelson and his other new starters progress will go a long way on how well this team will do. WIth three Power 5 road games (Nebraska, Northwestern, & Iowa State) in its first four games, the team also hopes to get to MAC play healthy. Most likely this team will regress some but still will compete for a bowl bid.